The oil cartel Opec has agreed its first supply cut in eight years in order to boost the price of oil. Mohammed Bin Saleh Al-Sada, Opec's president, said a cut of 1.2 million barrels a day would start from January. It comes after more than two years of depressed oil prices, which have more than halved since 2014, due to a supply glut on the market. 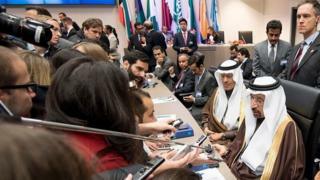 In addition to the production cut by Opec members, non-Opec countries will be expected to reduce production by 600,000 barrels a day, according to Mr Al-Sada. He did not list which countries these might be, beyond saying Russia was prepared to cut 300,000 barrels from its output of more than 10 million barrels a day. "This agreement comes from a sense of responsibility from Opec member countries and non-Opec member countries for the general well-being and health of the world economy," he said. The deal comes after oil ministers agreed to a cut in principle in September, which would have limited output by about 700,000 barrels a day while allowing Iran to increase production. But disagreements between Saudi Arabia - the world's biggest oil producer - and Iran led to doubts an agreement would be secured. Image caption Saudi Arabia agreed to cut output by about 500,000 barrels per day - a total reduction of 4.5%. It says its goal is to ensure the stabilisation of oil markets, "in order to secure an efficient, economic and regular supply of petroleum to consumers, a steady income to producers and a fair return on capital for those investing in the petroleum industry". Its members include Algeria, Angola, Ecuador, Gabon, Iran, Iraq, Kuwait, Libya, Nigeria, Qatar, Saudi Arabia, UAE and Venezuela. Indonesia agreed to suspend its membership today. A number of other major oil-producing nations such as the US and Russia are not Opec members. The Saudis were hesitant to shoulder the lion's share of a cut, while Iran had resisted reducing its own production, arguing it had yet to recover its output levels after years of sanctions. At Wednesday's meeting, however, Saudi Arabia agreed to cut output by about 500,000 barrels per day - a total reduction of about 4.5%. That will take its output to 10.06 million barrels per day. So Opec have finally done what they usually do - cutting production to deal with prices that are hurting their economies and government finances. One of the reasons for the delay was generally thought to be Saudi Arabia's welcome for the damage done to the shale oil industry in the US - whose rise was one of the key forces behind the price decline in the first place. It didn't really work. US industry oil production has declined somewhat this year, but it is still more than it was in 2014. Any boost to prices now is likely to bring more shale on stream - and they will probably "hedge" or make sure they are covered if prices subsequently fall back. Among the messages implied by OPEC's decision: the battle against shale has been lost. Iran, in contrast, was allowed to increase production slightly from its October level, a boost for Tehran. According to the Reuters news agency, this was achieved by suspending Indonesia's membership of Opec since the country, a net importer, could not cut output. Analysts stressed the deal was contingent on agreement from non-Opec members. "Without their agreement it is technically unworkable, so there is still some uncertainty hanging over it," John Chairman of Alfa Energy Group in London told the BBC. "So I think it is impressive they've got this far and got countries like Iran and Iraq to agree, but Russia could well change its mind about limiting production." Spencer Welch, director at IHS Energy, said the deal would provide a short term boost to oil prices, but added: "Disagreements persist among Opec members on how to measure production, so the deal will be hard to police." "US oil [including shale] will like the price rise and production will start rising soon," he also said. "But, this was going to happen regardless of any Opec deal today." Opec will hold talks with non-Opec producers on 9 December. The group will also have its next meeting on 25 May 2017 to monitor the progress of the deal. Can Opec agree to raise the oil price?